For fullface masks on breathing apparatus used out of water, see Self-contained breathing apparatus. A full-face diving mask is a type of diving mask that seals the whole of the diver's face from the water and contains a mouthpiece or demand valve that provides the diver with breathing gas. The full face mask has several functions: it lets the diver see clearly underwater, it provides the diver's face with some protection from cold and polluted water, it increases breathing security and provides a space for equipment that lets the diver communicate with the surface support team. Full face masks can be more secure than breathing from an independent mouthpiece; if the diver becomes unconscious or suffers an oxygen toxicity convulsion, the diver can continue to breathe from the mask unlike a mouthpiece which must be always gripped between the teeth. Full-face diving masks are often used in professional diving. They are relatively rarely used in recreational diving, where they protect the face from cold water or stings, such as from jellyfish or coral, and prevent the discomfort derived from gripping a mouthpiece between the teeth for long periods. The full face diving mask was invented by Yves le Prieur in 1933. This type of gear is also sometimes referred to as a Jack Browne rig, named for a Desco engineer who designed an early version of a full-face mask with an integrated air-supply attachment. The full-face mask provides breathing gas to the diver, and an air space to facilitate underwater vision. There is usually one air space for both breathing and vision, and this is automatically equalised by the breathing gas during descent. However, some models have a mouthpiece isolating the breathing gas supply from the rest of the interior of the mask, or have a divided interior, and the main air space must then be equalised during descent by exhaling through the nose. 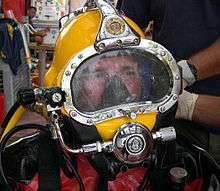 A full-face mask consists of a transparent faceplate (lenses, or window) through which the diver can see, a connection to a source of breathing gas, a means of removing any water which may get inside, some facility for the diver to block the nose to equalise the ears, a means of sealing these components to the diver's face and preventing ingress of water and a means of securing the assembly to the diver's head. Additional components may include communications equipment, lights, alternative breathing gas connections, and a means to defog the interior surface of the faceplate. Two basic configurations are in common use: Those with a soft elastomer skirt which seals around the periphery of the face, and those with a rigid frame supporting the other components, which is sealed to the face by a soft foam ring which is clamped to the frame by a metal band, to which the straps are secured. A system of three to five straps is used to secure the mask to the diver's head. This component is often referred to as the spider. It is usually a rubber component comprising a group of straps radiating from a central patch or ring, which rests against the back of the diver's head, low enough to resist slipping off over the top. The straps may pass through quick-adjust buckles attached to the mask skirt, or may have holes to hook onto the buttons of a band mask. This strap system is generally more secure than the single double-ended strap of the half-mask, and a full-face mask is considerably less easy to replace underwater if dislodged than a half-mask. The soft skirted full face mask is the more common arrangement, and is generally considerably lighter and more compact than the band masks. 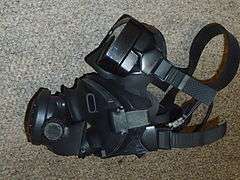 There is usually a strong plastic frame which supports the faceplate (or lenses) and a demand valve, but in some cases the lenses and demand valve or rebreather mouthpiece may be attached independently to the rubber mask, which is integral with the skirt. Band masks generally have a one-piece faceplate, which may be relatively large, firmly mounted to a rigid frame which holds the demand valve or other gas supply fittings. The frame may be of strong plastic or fibre reinforced composite. A face seal and in some cases a neoprene hood is clamped on by the metal band, which has several buttons protruding, onto which the straps of the spider are fastened to secure the mask to the diver's head. Where a hood is included, it may have a zipper up the back for ease of fitting, and the spider is secured over the hood. A band mask is generally heavier and more cumbersome to fit than a soft skirted mask, and is not easily fitted without assistance. It provides greater security and protection to the diver than a soft-skirted full-face mask, and is lighter and quicker to fit than a helmet. Most band masks are fitted with demand systems for gas supply, but can be operated in free-flow mode. 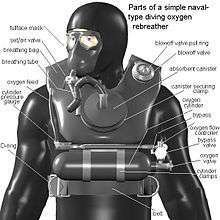 Circular, as in WWII Italian frogman's rebreathers and in some early British frogman's rebreathers. Oval like a sport eyes-and-nose mask, in some early British frogman's rebreathers. Triangular with rounded corners, in some Siebe Gorman fullface masks intended for use with an aqualung set. Triangular, with sharper corners, in rebreather masks made by DESCO. Some of DESCO's fullface mask windows were egg-shaped (wider above). In both these types of DESCO mask the window was very near the face for better horizontal and vertical field of vision and less deadspace, with a triangular bump-out for the diver's nose. Rectangular with the ends of the sides bent back for better sideways visibility, as in the Admiralty Pattern full-face mask made for many years by Siebe Gorman: see Siebe Gorman CDBA. Rectangular, continuously curved, for industrial breathing sets for use out of water. In some old masks, largely for industrial use out of water, small separate lenses above a rounded opaque nose-and-mouth mask, like some gasmasks. 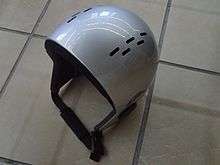 Kidney shaped, or approximately rectangular, with a deep cut-out for the nose pocket as in the Cressi fullface mask and the KM-48. The shape and maximum size of mask and helmet windows changed with availability of tougher and easily moulded transparent synthetic materials: Clear acrylic (perspex) became available in 1933 and polycarbonate in 1958. Copper helmet windows had been of glass for a long time, but a rigid helmet supported by the corselet can carry glass much thicker and stronger than a mask strapped over the face. The simplest arrangement is a single interior space, with no subdivisions, and no mouthpiece. This is most appropriate to free flow systems. In this arrangement the diver can talk clearly, including talking with other divers underwater. This allows communications equipment (usually an intercom wire or by modulated ultrasound) to be installed in the mask and is very useful for working divers. If an open plan full-face mask floods underwater, it can be more difficult to clear than with a mouthpiece. There also is the problem of "dead space" inside the mask causing risk of carbon dioxide retention. Free flow air supply overcomes these problems by providing so much air that the mask is constantly flushed. The cost is high noise level and very inefficient air usage. With a small (oro-nasal) breathing mask enclosing the mouth and nose inside the full-face mask, the dead space is considerably reduced, but the smaller space around the mouth increases the distortion of speech. A mouthpiece connects the gas supply directly to the diver's mouth inside the mask. If the mask floods, the diver can continue to breathe again while clearing the mask, and many Royal Navy and frogman's rebreathers have this mask arrangement. It makes clear talking difficult, but not impossible. 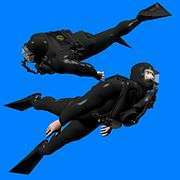 For very many years British armed forces divers have used the Admiralty Pattern full face mask, with a long rectangular window, largely flat, and bent back 90° at the ends, as in the illustration of a diver with a CDBA rebreather. The lower skirt has a hole that a breathing set mouthpiece is fitted through. The rigid plastic main frame of the mask has a rubber skirt which seals around the eyes and nose like a standard half-mask, and the nose may be pinched through the rubber nose pocket to equalize in the same way as with a half mask, and there is an extension to the skirt which seals around the lower part of the face and encloses the mouth. This mask has a clip-on pod section which carries the demand valve, and this part seals against the lower part of the frame, allowing the diver to remove the regulator pod when on the surface, or to use an alternative gas supply, which can either be mounted on another pod, or be an ordinary Scuba regulator second stage with a standard mouthpiece. This feature makes it possible to use bailout gas supplied by a dive buddy with a standard regulator while wearing a Supermask. An optional pod with a dive/surface valve for use with rebreathers is available to military users. Connection of surface supply and bailout hoses to a bailout block on the mask frame, typically at the right temple. From there integral plumbing takes the air to the integral demand valve and free-flow/defog port. Demand valve rigidly connected to the lower part of the frame, with external bailout block. Demand valve or rebreather mouthpiece plugged into the lower part of the frame. Demand valve plugged into a port on the side of the lower part of the frame (for bailout). Twin hoses ported through the lower part of the window, as in the Siebe Gorman aqualunger's full-face mask. Through the mask's flexible skirt at the bottom, as with Siebe Gorman frogman's masks, for example the Siebe Gorman CDBA. The early DESCO full-face mask's twin breathing hoses entered through the skirt at the sides, level with the lower end of the nose, pointing backwards and a bit downwards, to keep the breathing tubes shorter to reduce the risk of snagging. AGA mask with through-water comms. Military diver with full face mask with through-water comms. Draeger Panorama full-face mask with Apeks P-ported demand valve. Upper front view. Draeger Panorama inside view from behind. 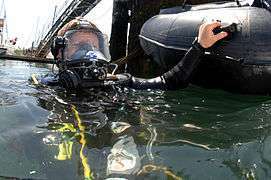 The full-face mask is generally the last piece of equipment fitted before the dive, as it is cumbersome and makes fitting other equipment more difficult by restricting the diver's field of vision, and the mobility of the head. The fitting may require the help of an attendant, particularly for the heavier band masks. The straps must be tensioned sufficiently to ensure a good seal, and to hold the mask securely to the diver's head, but not so tight as to cause discomfort during the dive. It is possible to adjust the fit to some extent during the dive. Water which enters the air spaces of the mask may be expelled either under the lower edge of the skirt, or through the exhaust port of the demand valve, or through a drain valve fitted for this purpose. The full-face mask must provide a means for the diver to block the nostrils for equalizing the middle ears. This may be provided in several ways. Some masks have a soft rubber nose pocket which allows the diver to pinch the nose directly, some have a soft cushion which can be pressed against the lower part of the nose to occlude the nostrils, and others have a mechanism which applies soft levers to the sides of the nose to pinch it in the same way that it would be done with fingers. The details of these mechanisms varies, but they all work. 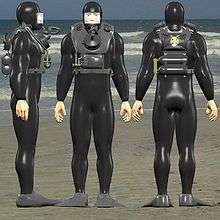 Some need to be adjusted to suit the individual diver, others are sufficiently flexible to fit almost anyone. 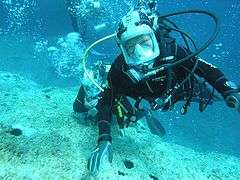 Most full-face masks do not have fresh airflow directly over the interior of the faceplate, and are to some extent susceptible to fogging by condensation during a dive. This may be minimized by application of a demister surfactant before the dive, by rinsing during the dive, or in those cases where the system allows, by purging the mask through a free-flow/defog valve, which directs a flow of dry air over the inner surface of the faceplate. This facility uses a lot of air, and is usually only available on models intended primarily for surface supplied applications. Full-face masks intended for use with scuba may provide a method of switching to atmospheric air when above the surface, to save breathing gas. Rebreather systems often incorporate a dive/surface valve in the mouthpiece which may provide an opening to the ambient environment when the loop is isolated. Some other full-face masks allow the demand valve to be unplugged on the surface, or provide a "snorkel valve" port which can be opened to allow atmospheric air to enter. The small saving on breathing gas is unimportant with surface supplied breathing apparatus. Emergency provision of an alternative breathing gas source is required in case of a failure of the primary gas supply. This is managed in several ways by full face masks. The most prevalent method for masks intended for surface supply applications is known as a bailout valve. The surface supplied diver generally carries a bailout gas supply sufficient to reach a place of safety based on the planned dive profile. This gas supply is regulated by a scuba first stage regulator, and plumbed into the primary air supply circuit via a bailout valve before it reaches the demand valve. The full face masks designed for surface supply work usually mount this valve on the side of the mask frame, in the bailout block, where it is convenient and easily reached by the diver. The bailout cylinder valve is normally open during the dive. To switch to bailout, the diver simply opens the bailout valve, and is immediately supplied by gas from the bailout cylinder. A similar functionality can be provided for masks without an integral bailout block, by mounting an external bailout block at a convenient place on the diver's harness. Surface supply and bailout supply hoses are connected to this block, which works exactly the same way as the integral block. The same method can be used for open circuit scuba diving, but this only allows for a single gas switch. Gas manifolds with more than two gas supply options are technically possible, but allow for a wider range of operator error and are therefore considered high risk, as the consequences of switching to a gas unsuitable for the current depth may be fatal. This system does not allow for supply of bailout gas to another diver. This system is used for most full face masks, as they have no other option. Surface supplied divers use the pneumofathometer hose to supply gas to another diver. Rebreather systems which use a bailout valve on the mouthpiece are often the method of choice for use with full-face masks, as the bailout mechanism is provided in the mouthpiece, and works the same whether used with a full-face mask or a half mask. A few models of full-face mask are provided with secondary ports to which additional demand valves can be connected, either by screw connector (Ocean Reef) or by bayonet style connector (Draeger). These allow for bailout or decompression gas to be ported to the mask via an entirely independent scuba set, but it is necessary to control which gas is used at any given time by using a valve on the supply line or cylinder. The Draeger Panorama mask also allows the primary demand valve to be unplugged from the mask and a bailout demand valve to be substituted. This can be done underwater with very little water ingress to the mask, and is closely equivalent to switching demand valves with a half mask, but a little slower and more complex. The Kirby-Morgan KM 48 Supermask is unique, in that the airspace for the eyes is completely separate from the mouth area, and the mask can be worn as a half mask by leaving off the mouthpiece pod, which holds the demand valve or rebreather mouthpiece. This allows bailout to a standard scuba demand valve with mouth grip, but also allows the diver to carry bailout gas fitted to a second pod, which can be clopped to the mask when the primary pod has been unclipped. This can be done underwater, and as there is a standard mouthpiece inside the pod, breathing can commence before the pod is fully connected and sealed. The pod can be cleared of water after sealing, and the eye-space is not affected by the switch. A final alternative sometimes used by recreational divers, is to bail out to a standard demand valve by removing the full face mask completely, and then fitting a backup half mask. When working or moving about in zero visibility water or in the dark. This often happens with underwater work, as a professional diver cannot always choose time and place of diving. If he is involved in a hand-to-hand fight underwater. This risk applies to combat/patrol frogmen in war conditions, or with police divers arresting suspects underwater. A full-face mask provides better security of breathing gas supply than a half-mask if there is a risk of the diver losing consciousness underwater. The mask faceplate is a high impact strength polymer which is securely attached to the skirt or frame. A failure of the faceplate can be a life-threatening incident with some full face masks, as the water will flood into the oro-nasal inner mask and compromise the air supply. This problem is avoided by the masks which include a mouthpiece. Design of fullface masks (underwater, land, gasmasks) in movies is sometimes constrained by desire to show the actor's face to the camera. There have been cases of fullface masks used in movie filming having a light inside shining on the actor's face so the face shows on camera better: a feature that is no use whatever in practical breathing mask use. In Fantastic Voyage the diving sequences were filmed using Italian ARO oxygen rebreathers with the mouthpiece (and diving mask) replaced by a pseudo fullface mask not intended to be dived in, because the diving actors were out of water suspended from thin wires. Self-contained breathing apparatus: many of them have full-face masks. Gas mask: most gas masks are full-face masks. 1 2 Norfleet WT, Hickey DD, Lundgren CE (November 1987). "A comparison of respiratory function in divers breathing with a mouthpiece or a full face mask". Undersea Biomedical Research. 14 (6): 503–26. PMID 3120386. Retrieved 2008-08-31. ↑ Middleton, JR (1978). "Evaluation of the U.S.N. Lightweight Diving Mask (Jack Browne).". United States Navy Experimental Diving Unit Technical Report. NEDU-14-78. Retrieved 2008-08-31. Robinson, M. The Encyclopedia & Guide To Diving With A Full Face Mask, Trafford Publishing, 2012.